With the objective of increasing the number of UPRM researchers in the biomedical/biobehavioral sciences seeking NIH funding, the UPRM NIH EARDA Project sponsored the 2015 NIH Grant Writing Initiative. This initiative was aimed at assisting researchers to write competitive NIH grant proposals by providing them the tools and resources for successful grant writing. The selected applicants (8 from UPRM) received as incentives: 1) individualized support by the R&D Center’s Proposal Development Unit staff, access to its resources and associated consultants; 2) a 4 day intensive Grant Writing Bootcamp with lodging, at Catholic University of Ponce, with on-site NIH funded mentors available for consultation; 3) Free participation at the NIH on Campus seminar with Sally Rockey of the NIH OER office and Michael Sesma of NIGMS. 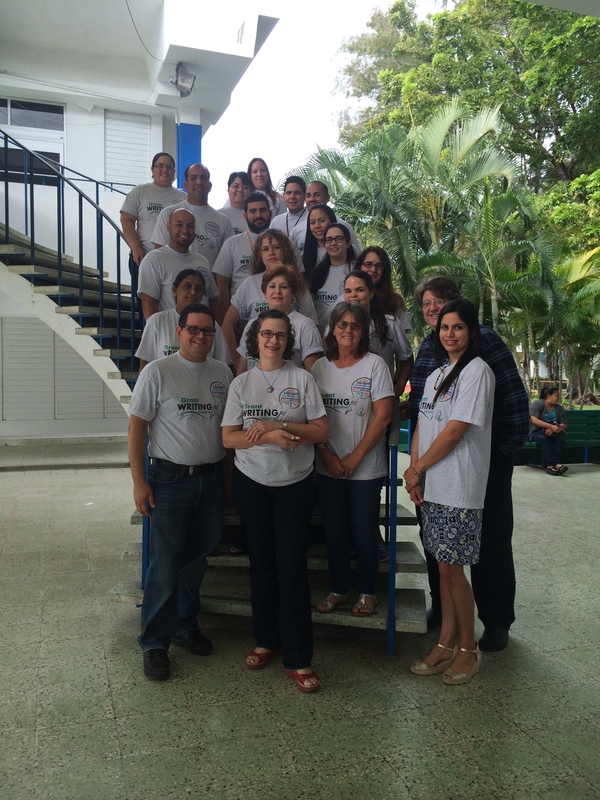 This year, we also collaborated with faculty from the Catholic University of Ponce and included 6 of their faculty in the GWI. GWI participants become part of a growing ‘community of NIH researchers and grant writers’ enjoying the assistance of external and internal facilitators and coaches in their grant writing efforts. Good luck to this year’s participants; thanks for all your hard work and dedication! The PDU, in collaboration with the UPRM Research Academy and the Professional Enrichment Center, hosted an all day information session on NIH grants with the Deputy Director of the NIH Office of Extramural Affairs, Sally Rockey (also author of the Blog “Rock Talk”), and Michael Sesma, the chief of the Postdoctoral Training Branch of NIGMS. 115 attendees from all parts of the island and 11 different universities/campuses participated. To visit the event website, please click here. Click here for information about the UPRM Research Academy (Academia de Investigacion) .